Bill was a friend of mine in semi- nary who had come to Christ out of a blatantly sinful lifestyle. He described it this way: “I was driving down the street drinking a bottle of brandy with another man’s wife at my side. When I saw some Christians on the sidewalk witnessing to passersby about Christ, I drove by and shouted, ‘Fools!’ But only a few weeks later I found myself kneeling in a church and asking Christ to become my Savior and Lord.” Bill’s conversion resulted in his giving up his old ways and experiencing a new life in Christ. It was a life-changing turnaround. True repentance, which is initiated by the Holy Spirit, includes a real turnaround. Often we see that the greater the opposition to the gospel prior to conversion, the more stunning the change of direction afterward. When Saul of Tarsus encountered Christ on the road to Damascus, he was changed from a persecutor to a preacher of the gospel. Of this many observed: “He who formerly persecuted us now preaches the faith which he once tried to destroy” (Gal. 1:23). Authentic conversion includes repentance, which is a change of mind and direction. For the follower of Christ, repentance means to keep turning away from sin and turning toward Christ in obedience. Repentance is being so sorry for sin that you are willing to give it up. While on vacation in Alaska, we visited the El Dorado Gold Mine near Fairbanks. After a tour and demonstrations of mining techniques during Gold Rush days, we got to do a little panning for gold. Each person was given a pan and a bag of dirt and stones. After pouring the contents into the pan, we added water from a trough and swirled it around to stir up the silt and allow the gold, which is heavy, to sink to the bottom. Even though we had watched experts, we made little progress. The reason? Concerned about discarding something of value, we were unwilling to throw away worthless stones. This reminded me of how possessions sometimes keep us from finding what is truly valuable. Jesus had an encounter with a rich man for whom this was true. His earthly wealth was more important to him than spiritual treasure (Luke 18:18-30). Jesus said, “How hard it is for those who have riches to enter the kingdom of God!” (v.24). Although money is not evil, it can prevent us from inheriting true riches if accumulating it is the goal of our lives. To hoard wealth is foolish, for it is genuine faith, not gold, that will sustain us through trials and result in praise, honor, and glory to God (1 Peter 1:7). Keep your eyes on Jesus so you don’t allow earthly riches to blind you to spiritual riches. My testimony can be summed up in eight short sentences. Memorizing Scripture makes meditation possible at times when I can’t be reading the Bible, and meditation is the pathway of deeper understanding. Memorizing Scripture strengthens my faith because faith comes by hearing and hearing by the word of Christ, and that happens when I am hearing the word in my head. Memorizing Scripture shapes the way I view the world by conforming my mind to God’s viewpoint. Memorizing Scripture makes God’s word more readily accessible for overcoming temptation to sin, because God’s warnings and promises are the way we conquer the deceitful promises of sin. Memorizing Scripture guards my mind by making it easier to detect error—and the world is filled with error, since the god of this world is a liar. Memorizing Scripture enables me to hit the devil in the face with a force he cannot resist, and so protect myself and my family from his assaults. Memorizing Scripture provides the strongest and sweetest words for ministering to others in need. Memorizing Scripture provides the matrix for fellowship with Jesus because he talks to me through his word, and I talk to him in prayer. That’s my testimony. I hope it will motivate you to make your own discoveries. A friend who lives in Singapore told me about an old Chinese greeting. Instead of “How are you?” people would ask “Have you eaten until you are full?” The greeting likely originated during a time when food was scarce and many people did not know when they would have their next meal. When food was available, it was advisable to eat until they were full. After Jesus miraculously fed 5,000 people with five loaves and two small fish (John 6:1-13), the crowd followed Him wanting more (vv.24-26). The Lord told them not to work for physical food that spoils, but “for the food which endures to everlasting life, which the Son of Man will give you . . . . I am the bread of life. He who comes to Me shall never hunger, and he who believes in Me shall never thirst” (vv.27,35). As followers of Jesus, we should help those who lack adequate physical nutrition. And with all, we can share the good news that our hunger for inner peace, forgiveness, and hope can be satisfied by knowing Christ the Lord. Jesus Christ, the bread of life, invites us to come to Him for His feast for the soul, urging us to eat until we are full. Thank You, Jesus, that You call out to those who are weary and thirsty and say, “Come to Me and be filled.” We are hungry and are thankful that You satisfy us. Amen. There is a longing in every heart that only Jesus can satisfy. Nine years ago today a good friend went out for a lunchtime jog and never came back. Kurt De Haan, who was the managing editor of Our Daily Bread, died of a heart attack on that sunny Thursday. Some of us who worked with Kurt still keep mementos of him in our offices. For instance, on one wall of my cubicle, I display the last memo I received from Kurt. It reminds me of his thoroughness as an editor—striving to represent God’s Word accurately and well. Another co-worker displays the last paper wad Kurt threw in her direction, reminding her of his eagerness to enjoy life. Each time we talk about Kurt and how much we miss him, we discuss his combination of a quest for excellence mixed with an enjoyable personality. He worked hard and loved life. He strove to teach God’s Word with integrity while living his life with joy. Remembering Kurt and his example is refreshing and challenging. It reminds us that others are watching us and can tell if we’re serving “the Lord with gladness” (Ps. 100:2), and if our love for Jesus is coming through in our good works (Eph. 2:10). Serve well. Serve with joy. Does that describe our work for the Savior? Help me, dear Jesus, to live out the joy and peace You’ve given to me. May those who work with and know me see that joy. And may I always stand for truth and righteousness. For joy that will last, always put Christ first. Unique Feature: This is a nation which has been blessed with rich natural resources, traditions and ethnicities. Its motto is “Bhinneka Tunggal Ika” (Unity in diversity literally, “many, yet one”). Indonesia consists of distinct ethnic, linguistic and religious groups. Pray that the unity in diversity tightly binds this nation. Pray for the government of Indonesia. Let there be the fear of God upon the leaders. Let God give them the ability and wisdom to lead this nation. Pray for the protection over the churches in Indonesia. Every evil scheme to attack the Christians there will be turned into good and the name of the Lord will be lifted up. Let every prophecy upon Indonesia be fulfilled. Every knee shall bow and every tongue confess that Jesus Christ is Lord. As a 12-year-old, I was curious about the Bible my dad was given when he retired from the paper mill. It came in a special cedar box marked The Holy Bible, and I assumed that “holy” meant it was off-limits to me. But still I peered inside. In the center of the Bible was a picture of Jesus hanging on the cross, along with the words of John 3:16. There was also a see-through red film covering the page, which I assumed meant He bled and died. Occasionally, when no one else was looking, I would gently pull the holy Book off the shelf, open the box, look at the picture of Jesus on the cross, read the verse, and wonder about this Man and why He died. I wondered if His love was meant for me or if it too was off-limits. Several years later I heard a message about how God had provided access to His love through Jesus. Romans 5:1-2 tells us: “We have peace with God through our Lord Jesus Christ, through whom also we have access by faith into this grace in which we stand.” I believed and received Jesus’ salvation from my sin. Aren’t you thankful that the Bible and God’s love aren’t off-limits? Receive His forgiveness—it’s meant for unholy people like you and me. 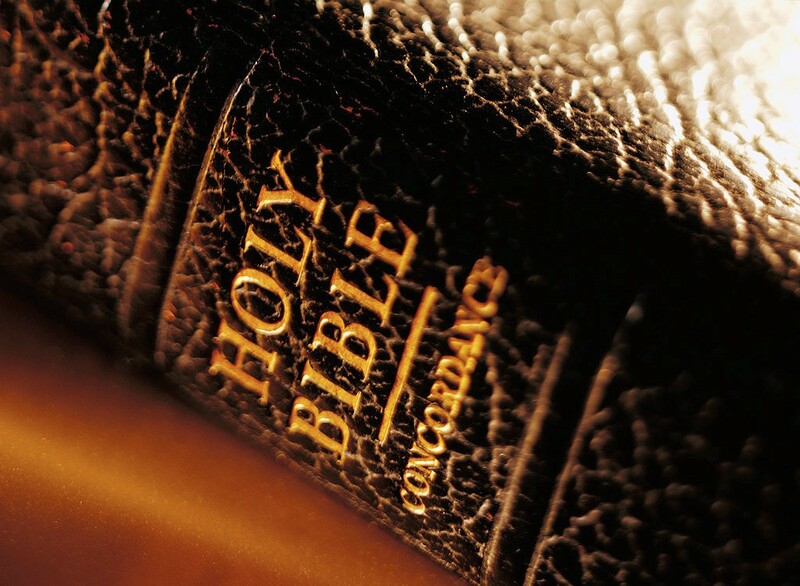 How precious is God’s holy Word— Its pages every one! The Bible is God’s love letter to us.